I’ll be at this one, with Bethalynne Bajema, and Anthony Carpenter, and with art from James B Hunt and Chad Savage, as well as a large assortment of the best lowbrow and pop surrealist artists in Grand Rapids. The event page is here: https://www.facebook.com/events/529928347047019 , but you can read the full description below. I still recommend adding yourself to the facebook event page to be in the know for new updates and additions. Also, the pen and ink I did this flier from (and that I will be doing one of my paintings from, is available in my store, HERE. Join us Saturday Night, February 16th – At Ice Cream Gallery and Toys In Grand Rapids, Michigan for Valentine’s Day Weekend Tiki Party, hosting a broad sampling of American Pop Surrealists, Pop Artists, and Lowbrow artists. 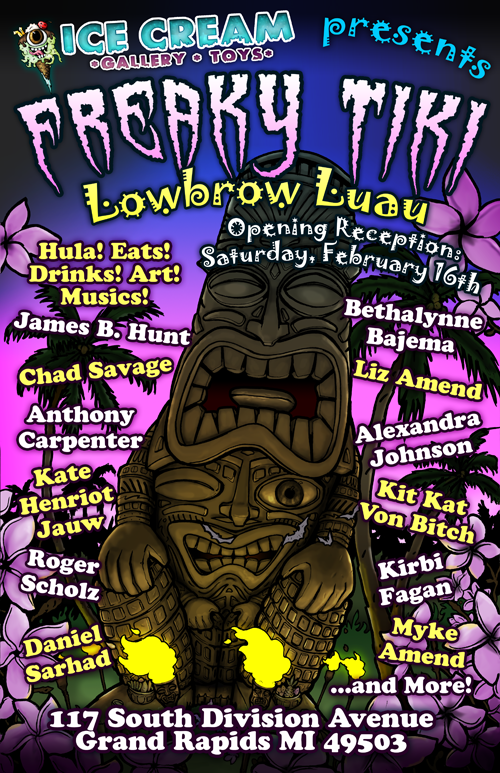 From sculptors to engravers to illustrators to painters and more – drawing from many styles and many genres… dark and brooding to light and whimsical – making for a very unique and interesting Tiki-Themed show at one of Grand Rapid’s newest and most interesting art venues. Refreshments, snacks, dancing, live music, and art will be served – visit our facebook page for updates and more info.